UC Cooperative Extension will train farmers June 6 at the UC West Side Research and Extension Center in Five Points on the benefits of soil management and a systems-oriented approach for achieving healthy soil. The free program runs from 9 a.m. to 1 p.m. and includes lunch. RSVP online at http://ucanr.edu/SoilMgmt. The West Side REC is at 17353 W. Oakland Ave., Five Points. Science-based, long-term research information as well as practical testimonies of experienced farmers are key elements of the curriculum. The program will feature discussion on all components of soil biology, including bacteria, fungi, nematodes, weeds and soil macro fauna. Reduced disturbance tillage and the use of cover crops and compost will be showcased. 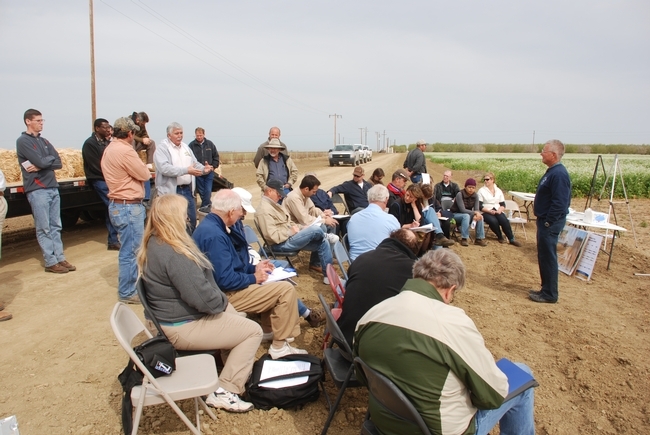 Farmers gather for training at a previous conservation agriculture field day. A half-day workshop titled 'Benefits of Soil Management for Farming Systems" will be held June 6, 2017, at the UC West Side Research and Extension Center in Five Points. The training will be conducted at the site of an ongoing, 18-year research study at the West Side REC. The June 6 program will include presentations of systems management goals and practices by four farmers, results based on published research by UC and USDA study investigators, and in-field observations of changes resulting from the improved soil management practices. “This is an opportunity for Central Valley farmers, consultants, and agency people to learn in one setting how managing a farming system from an ecological framework impacts resilience, pest management, profitability, and overall production," said Scott Park, a Meridian, Calif., a farmer who will be part of the program. 4.5 CCA CEUs and 1.0 PCA CEUs are approved for the training. Please RSVP online at http://ucanr.edu/SoilMgmt. Click here for the full program (pdf). Learn more about the sorts of conservation agriculture systems that are being featured in this soil management training at http://www.uctv.tv/sustainable-cal/search-details.aspx?showID=32353. 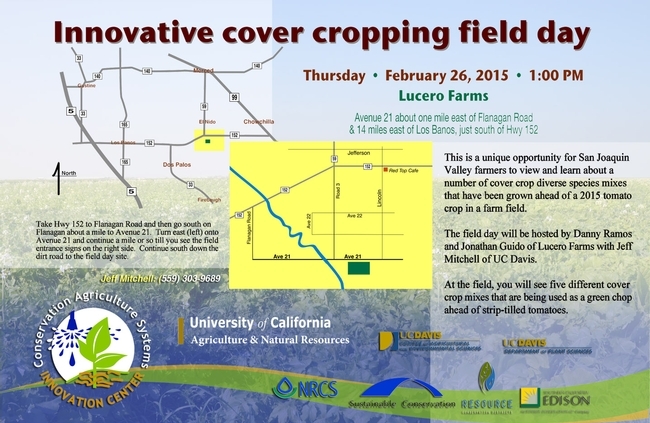 CASI invites you to take part in a very interesting field educational event this Thursday, February 26th, at one of the fields of Danny Ramos and Jonathan Guido of Lucero Farms just south of Hwy 152 about midway between Los Banos and Chowchilla. Take 152 from either the east or west and then take Flanagan Road south about a mile. From there, turn east (left) onto Avenue 21 and follow this road about a mile or so till you see our sign on the right side of the road. Take the dirt road south about a couple hundred yards to the cover crop field. Call Jeff Mitchell that afternoon at (559) 303-9689 if you need help finding the field. Map of location: Lucero Farms, Avenue 21 about one mile east of Flanagan Road & 14 miles east of Los Banos, just south of Hwy 152. Click here to listen to Doug Cooper's radio interview with Jeff Mitchell about this Field Day at Lucero Farms on February 26, 2015. The Conservation Agriculture Systems Innovation Center will hold a two-stop field tour of innovative and cost-cutting no-till cotton production systems on Thursday, May 30. The program begins at 9 a.m. in south Dos Palos (Nees Avenue and I-5) and continues at 11 a.m. at the UC West Side Research and Extension Center, 17353 W. Oakland in Five Points. Some of the presentations are repeated at both sites. During the field visits, participants will learn about no-till cotton production techniques and how the systems help farmers address farm economics and regulatory issues. The sessions also provide information about how no-till systems help improve soil quality. 2. Opportunities and techniques for successful no-till cotton, Monte Bottens, California Ag Solutions, Madera, Calif.
For more information, contact Jeff Mitchell, jpmitchell@ucanr.edu, (559) 303-9689. 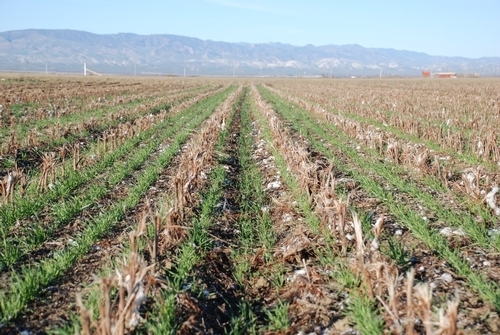 Cover crop growing in cotton and tomato residues.